A holistic approach to women’s health has a home in local Maternal and Child Health. 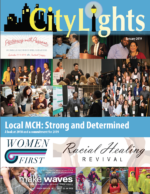 Our commitment in the new year is that CityMatCH will continue to promote equity and work to improve the health of all women, children, and communities across the nation. We will listen to our membership, associate members, and partners, and look for ways to incorporate we learn into all of our work. We will create space for learning, sharing, and supporting each other. We will communicate at a national level about the impact of local MCH work, challenges, and success. This issue highlights some of our current work, reflects on 2018, and celebrates the accomplishments of close colleagues.